It’s a phrase you’ll often hear if you try and press physicists for answers to the most difficult questions. “What happens at the center of a black hole?”, “What happened in the first moments of the Big Bang?” Modern physics is currently not advanced enough to be able to give answers to these questions. The explanation you’ll be given for this is that the “laws of physics break down” in these scenarios. But what does “the laws of physics break down” actually mean? In truth, it can mean all kinds of things, but there’s one thing that it never means. When we say that the laws of physics break down at the center of a black hole, we don’t mean that we can never use physics to describe what goes on inside a black hole. A common source of problems in modern physics are singularities like black holes and the Big Bang itself. Singularities are problematic because various quantities to do with the singularity become infinite, and infinity is not a physical quantity. Singularities are unphysical, they’re a sign our physics isn’t advanced enough yet. Take a black hole as an example. Black holes are objects with such a huge mass that they become crushed by their own gravity. There is no known process that will prevent the material forming the black hole from being crushed into zero volume. But if a huge amount of material is crushed into zero volume, then the density of the black hole becomes infinite. It is at this point, with the appearance of infinities, when we say that the laws of physics have broken down. What has actually happened here? We have a physical theory of gravity – general relativity, but the problem is that if we apply general relativity to the center of a black hole we get useless infinite answers. What this indicates is that our current laws of physics are incomplete. General relativity works perfectly well for most of the universe, but there must be some assumption, or something missing from the theory which means that it is unable to provide sensible answers in extreme environments like the center of a black hole. There are two possible ways of solving this problem that spring to mind. First of all, it may be the case that there’s some physical process that prevents anything being crushed into zero volume. A normal star doesn’t collapse under its own gravity because of an effect known as “radiation pressure” which counteracts the gravitational collapse. A neutron star is a star which has been crushed under its own gravity, but an effect known as “neutron pressure” prevents the neutron star being crushed any further. It may then be the case that at the center of a black hole is an object of finite size which is prevented from being crushed into zero volume because of some as yet unknown physical “pressure”. A second possibility is that spacetime itself is discrete, not continuous. 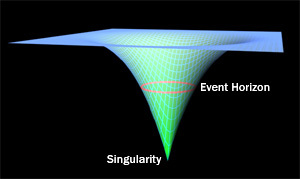 The singularity problem arises from the fact that our current theory of spacetime – General Relativity – treats spacetime as being continuous. This continuity of spacetime means that objects can be crushed infinitesimally small. If spacetime is discrete however, like the pixels on a screen, we no longer get infinities appearing because nothing can be crushed to zero volume. At the forefront of discovery in physics, equations become extremely complex and impossible to solve fully. 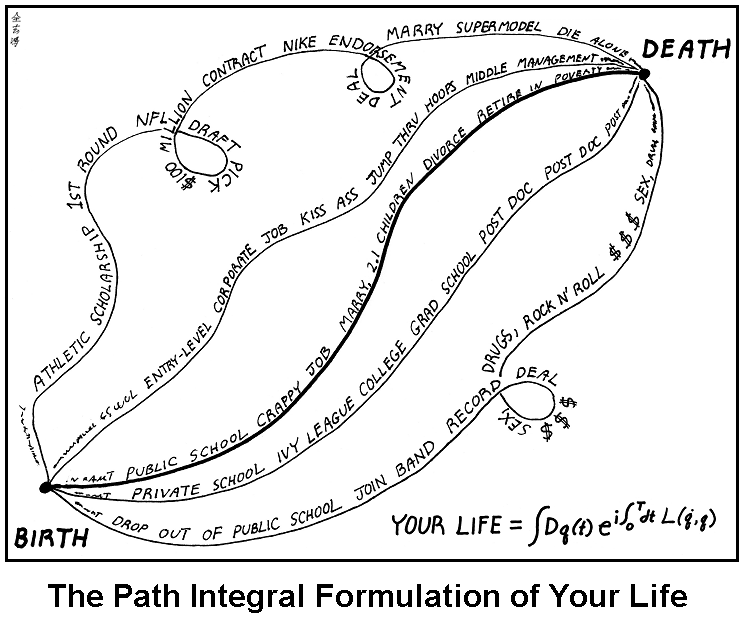 Take the path integral for instance. The path integral is a staple ingredient in quantum field theories, but they’re essentially impossible to evaluate exactly. To evaluate a path integral one would have to add up the expression inside the integral evaluated over every possible pathway that the particles in the system can take to get from one point to another. This is clearly an impossible feat. Instead what we often have to do is make approximations that allow us to “perturbatively expand” the equation. In the case of the path integral, we make the approximation that the strength of interactions between particles is small. This allows us to expand the path integral as a sum of Feynman diagrams which we can evaluate exactly up to a sufficiently high order to get an approximate, but fantastically accurate, answer. Obviously we can’t use this technique in every scenario. If interactions between particles are sufficiently strong then we can’t use this approximation and so we say the “laws of physics break down”. This is basically what physicists mean when they say that the “laws of physics break down at the Big Bang”. In the Big Bang, interaction energies and strengths are extremely high, so we can no longer use the approximations that we used to make. What we need is a new theory of physics that will allow us to deal with such high energy regimes. I hope this gives a flavour of what is meant by the phrase “the laws of physics break down”. It never means that there is no chance of us ever finding laws to describe the physics of the Big Bang and black holes, it’s more a statement of “we’re not there yet”. Modern physics is extremely complicated and difficult to solve and so we often have to make approximations. These approximations will often not be true for extreme situations like the Big Bang.